I haven't really promoted founder and creator of Muxlim.com Mohamed El-Fatatry like I thought I would. You know, with streamers, cheerleaders and green flags. 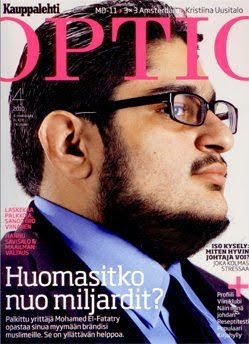 Photographed below on the cover of Kauppalehti Optio (the top glossy business magazine in Finland) on March 4th 2010, is our European brother and online manager Mohamed. Looking pretty spiffy too, alhamdulillah. ahh, very cool. Ma'sha'allah, M is a handsome bro.